Except that won’t happen. 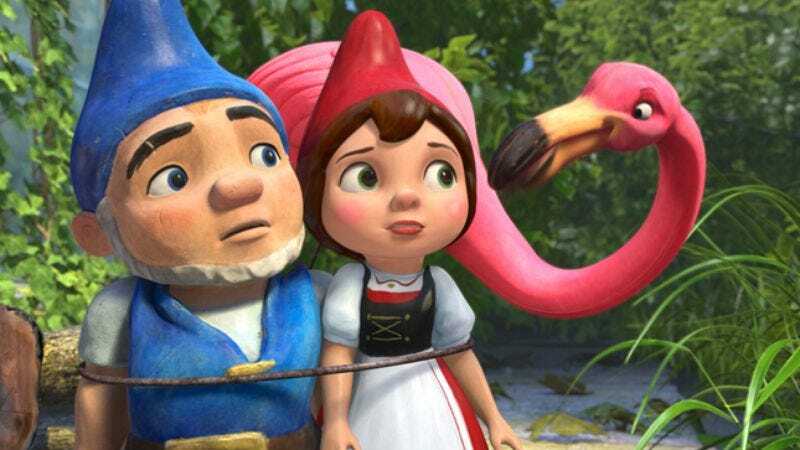 Gnomeo is a charming-enough kiddie take on Romeo & Juliet, with the Montagues and Capulets reimagined as pottery garden gnomes who come to life, Toy Story-style, when their human owners aren’t watching. Those owners hate each other, and their lawn décor follows suit, rallying red-hatted gnomes against blue-hatted ones in a well-established grudge-fest. But inevitably, a Blue named Gnomeo (voiced by James McAvoy) and a Red named Juliet (Emily Blunt) fall in forbidden love, over an enjoyable bonding sequence where they impress each other with competence and skill. It’s one of the film’s better stretches, focused on quick-paced animation and casual character charm. Gnomeo gets some winning mileage out of such moments, and out of its terrific visual and audio aesthetic: Toronto’s Starz Animation studio clearly put a great deal of attention into every realistic nick, chip, brush stroke, and hunk of moss on the gnome characters, as well as into the little pottery tinks they make when they interact with each other or their environment. But far too much of the film is devoted to eye-rolling pop-culture gags and long montages set to recycled Elton John songs. (The film also features two new John numbers, with lyrics by his longtime partner Bernie Taupin: “Hello Hello” is a bouncy but generic duet with Lady Gaga, while “Love Builds A Garden” seems like John’s attempt at Randy Newman sap.) It’s half jukebox musical and half Shrek-esque spot-the-reference game, with gnomes saying things like “I wish I could quit you” and singing (to John’s “Your Song”) “It’s a little bit runny, this pesticide…” And hoary old gags like “I am not illiterate! My parents were married!” will sail right over kids’ heads without impressing grownups, either. The committee-polished script (seven credited writers, not counting Shakespeare, or the two other screenwriters who first pitched this screenplay) is wearyingly lazy, relying on referential one-liners, gimmicky celebrity voice cameos (Jason Statham, Dolly Parton, Michael Caine, Hulk Hogan, Ozzy Osbourne, and many more), goofy accents, and a tired “Now everyone dances!” ending to goose bored audiences. There’s little harm in this blah retelling, but there’s no justifying the film’s pathetic boasting, either.